In 1840, Mr. Joseph McCreary gave land to build the first long schoolhouse on Lot 3 Concession 3 near Highway 7. In 1871, this schoolhouse was purchased by Mr. Weir for a piggery and another one was built nearby. Three generations of McCrearys attended this school before it closed in 1968 and was destroyed by fire in the 1990's..
"Yearning for Learning" says the first school opened in 1837. In 1867, Jessie Paul was the teacher, earning a salary of $120 per year. There are few records about this school as it burned to the ground. This schoolhouse, owned by Shannon Moore, was built in 1909. It closed in 1962 and remaining student went to Union Hall - S.S. No.3. It reopened in 1963 when students of S.S. No. 14 Ramsay came when their school burned down. By 1827, two schoolhouses were built near Clayton. There was an average of 20 pupils and it is thought that John Young was the teacher. He agreed to "teach the children of the household and to turn over his deed for his lot if the Robertson family provided board, washing and mending clothing and attending to him in sickness and to bury him in a decent manner". (p. 36 Rural Schools: Ramsay Township) In 1870, there was disagreement as to where a new school needed to be built. Eventually, a larger one-room schoolhouse was built on Mr. Sutherland's land on Clayton Road. It was heated two two box stoves. A well was dug in 1915 and electricity was installed in 1949. Jessie Steele was the last teacher when the school closed in 1964. In 1965, the school was moved to the corner of the Eighth Line and the Old Perth Road and it is now part of the Mississippi Mills Public Works Complex. Originally, there were three early schools in this area - one on second line at Clayton Lake and Beaton's Resort, another on James Smith's Property, Lot 21 Concession 2 at Bolger's Corner and McMunn's Schoolhouse was built on the corner of Lot 23, Concession 4. Bathrooms consisted of one side of a bush for the girls and the other side was for boys. Using money from the Township tavern licenses, a new school was built in 1866 by the Indian River. It was used until it became too crowded and another school was built in 1872 which had a cloakroom and two bathrooms at the back. Students put on concerts with a 10 cent admission fee in order to buy a bell and later an organ and piano. They would try to sit near the wood stove in the wintertime, as it was the building was not insulated. The school operated until 1969. Fred Forsythe was the last teacher when the students went to Comba and then to Naismith School in Almonte. The former schoolhouse is now a private residence. Daniel Galbraith purchased land on the West half of Lot 11, Concession 5 in Ramsay township in 1855. He sold half an acre to the trustees in 1870 for $1.00. The first teacher was Nell Forest. Ratepayers became enraged when the Ramsay Township School Boarded voted to close the school, so in 1958, S.S. No. 5 became a separate school section. Ratepayers donated two cords of wood per family. A new piano was purchased and a music teacher was hired. 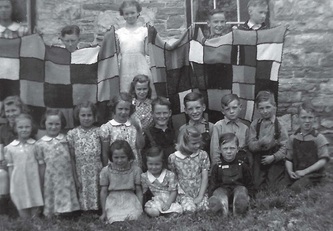 In 1969, the rural pupils were bussed to Almonte or Carleton Place. The school was moved across the road to become Bert Hazelwood's cabin in his bush. It was later used as sleeping quarters for retreats. During 1845 and 1855 there was much dissension over which school should receive the school grant for the district. The two sections were united as Union School with George Brown as the teacher. He had a third class certificate and agreed to teach for ₤45 per year. In 1864, a brick school was built and someone was paid $1.00 to clean out the outhouses. The last school on this site was constructed in 1925 and it closed in 1969. It is now a private residence. In 1830, the first school was built on the North East corner of Lot 5, Concession 7 on land owned by William Houston. The present building was constructed on the North East coner of Lot 3, Concession 7 in 1843. For many years, the school has a small population of between 8-10 pupils, but it increased to 18 when it became affilited with the Ramsay Township School Board. By 1960, the school was heated by oil and in 1961-1962, students from S.S. No. 14 were transported to S.S. No. 8 to boust the enrolement. This former school is now a residence. Built in 1856 of local limestone on the 8th Line of Ramsay Township just west of current day Almonte, S.S. No. 9 Ramsay is an excellent example of a mid-nineteenth century rural schoolhouse. It remained in continuous service as a school and meeting hall for the residents of Leckie’s Corners and surrounding area for 114 years. In 1917, the school inspector, Willis Froates wrote that the school should be condemned, but not much was done to improve the situation. In the 1940s, music teachers, Hector Dalimore and later Dana Featherstone, travelled to the different schools in the area. Teacher, Miss Winnie Lamrock gave each pupil, who did well, a silver dollar in 1937 when King George VI was crowned. Mrs. Lillie Corkery began teaching in this school in 1958, until it closed in 1970. In 1984, this property was designated under the Ontario Heritage Act for its architectural and social importance. 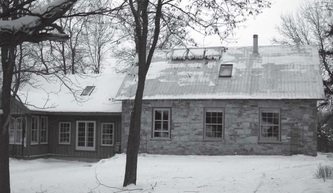 Michael and Jean Macpherson converted the school to a home when they became the owners in 1971. Arriving from Scotland, John McCarter taught in a log school at Bennie's Corners from 1852 to 1865. One third of the building was the teacher's living quarters and two thirds was the classroom. Self taught, Mr. McCarter taught extra subjects like Euclid and Latin Grammar. Between 1875 and 1888, Thomas Caswell taught Latin, logic and higher mathematics. One of his students was James Naismith who invented the game of basketball. Bennie's Corners pupils who the trophy for the Rural School Fairs for many years. Anne Lowry Snedden was the last teacher when the school closed in 1969 and the students were schooled in Almonte. The building is now part of a private home. The log school, S.S. No. 11 was first recorded in 1830. Edward B. Mahon had about 60 pupils in 1854 when a new school was built. Enrolment increased to 78 students ranging in age from 5 to 15 in classes from Primary to High School Continuation level (about Grade 10)! A brick school opened in 1877 at Donaldson's Corners. Mr. Andrew Wilson installed a flag pole in 1908 as a patriotic gesture. The brass handbell was rung for the last time at Appleton in December 1969. Children took the bus to the school in Almonte. On June 26, 1971, at the request of the North Lanark Historical Society, the old school became a museum. Fire destroyed the brick structure in July 1979. A new museum was dedicated on the site as the Doreen Drummond Museum and opened in 1980. Trustees John Dunan, James Simpson and Robert McKinlay purchased land from Charles Simpson on December 12, 1843. The deed was registered in 1980 and a log school was built on eleventh line of Ramsay. In 1865, the second log structure was a little larger and furnished with wooden benches with no backs. There were two wooden blackboards and students used slates. Edward Rose was the teacher who received free board for his efforts. The school closed in 1965 and students when to Appleton or Almonte to complete their schooling. In 1826, a long builting was found on Rea's lot. Early teachers, Mr. Huggart and Joseph Rea, lived in a house in Greig's field. James Greig sold one quarter acre on the eighth line, Lot 10, Concession 7, Ramsay for $4.00 and a frame building was put up. Andrew Greig sold another quarter acre of land in 1878 to enlarge the school grounds. Mrs. Pearl McCann created history when she became the first married female teacher in 1942. When S.S. No. 5 only had 5 pupils, the Board decided to amalgamate the two schools from 1945-1947. In 1963, the school was destroyed by fire and students had to temporarily attend S.S. No. 2 Ramsay. On June 30, 1960, many former students and teachers celebrated the 100th anniversary of the school. In 1970, pupils from S.S. No. 14 moved to Naismith Memorial in Almonte and the school property was sold to Edgar Finlayson for $4,500. It is thought the first log building in the Rosebank area, on the East half of Lot 23, concession , Ramsay was constructed about 1856. Male teachers received higher rates of pay than female teachers. At times, there were more than 60 children in eight grades. In 1873, a brick school was erected for $200. The log school became a barn for pigs on the Syme's farm. James Naismith, the inventor of basketball, was one teacher in 1882. In the 1940s, there was great excitement when the secretary of the board, Charles Tate would arrive one day a month with a projector and a film from the National Film Board. From November to April, the teachers were expected to cook a hot lunch of soup, pork & beans and canned peas on a two burner hot plate. During WW II, students were taught to unite against one of the deadliest enemies of history, one who wished to destroy their Christianity. They were encouraged to buy War Savings Stamps, as every cent helped to pave the way to victory, happiness and peace. Pupils got a day off from school on June 2, 1953 for Queen Elizabeth's coronation and went to see the parade in Almonte. S.S. No. 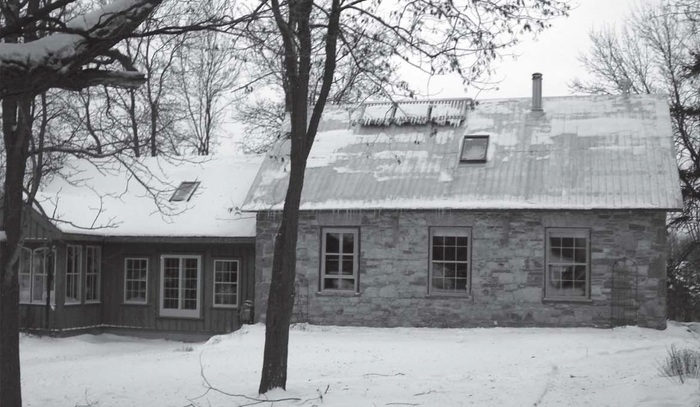 15 closed in April 1970 and the students were sent to Naismith Memorial School in Almonte to complete their studies. 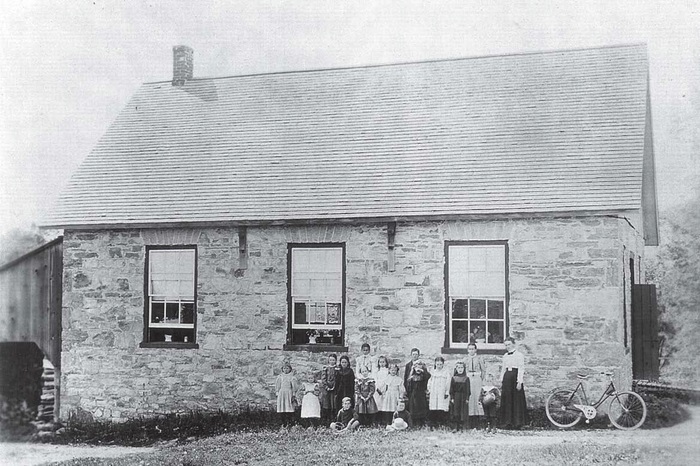 I am grateful for much of the information about the one-room schools in Ramsay Township from the book "Rural Schools: Ramsay Township, Pages of the Past, County of Lanark, Ontario Canada". To purchase this book, go to www.archiveslanark.ca .